An RC-106 cylinder with 14,5 cm2 effective area operating at 700 bar will generate what force? An RC-106 cylinder lifting 7000 kg will require what pressure? Pressure = 7000 x 9,8 N ÷ 14,5 cm2 = 4731,0 N/cm2 = 473 bar. 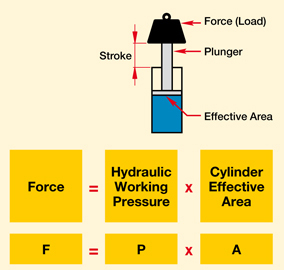 An RC-256 cylinder is required to produce a force of 190.000 N. What pressure is required? Pressure = 190.000 N ÷ 33,2 cm2 = 5722,9 N/cm2 = 572 bar. 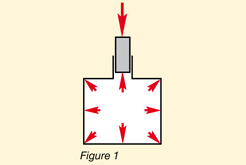 Four RC-308 cylinders are required to produce a force of 800.000 N. What pressure is required? Pressure = 800.000 N ÷ (4 x 42,1 cm2) = 4750,6 N/cm2 = 476 bar. A CLL-2506 cylinder is going to be used with a power source that is capable of 500 bar. What is the theoretical force available from that cylinder? An RC-158 cylinder with 20,3 cm2 effective area and 200 mm stroke requires what volume of oil? An RC-5013 cylinder has an effective area of 71,2 cm2 and a stroke of 320 mm. How much oil will be required? An RC-10010 cylinder has an effective area of 133,3 cm2 and a stroke of 260 mm. How much oil will it require? Four RC-308 cylinders are being used, each with an effective area of 42,1 cm2 and a stroke of 209 mm. How much oil will be required?